Over 300 women from 36 districts including the capital city Dhaka and from different organizations joined together on Mirpur Road, opposite to Narigrantha Prabartana (NGP) for the event of Women in Black. In black clothes, a symbol of protest, women reminded of the continued injustice, discrimination and violence that are going on not only to women but to all people in different countries and different situations. It was organised by Narigrantha Prabartana, Odhikar and Odhikar. This event ook place on the occasion of the International Women's Day 2010. Women stood with 'prodeep', the traditional earthen lamp, from 5:00 PM to 6:30 PM, starting just before the sunset and ending when dusk started to crawl into the busy city. 'Prodeeps' are used traditionally to light rural households for hundreds of years. The golden flame of the 'prodeep' is a symbol of courage to defeat darkness and evils in order to protect households and the community. Standing with 'prodeeps' in women's hand on a busy city also symbolises women's sense of connectedness with the rural population and the urban working class. The history of the women's struggle in their own communities is incomplete without remebering the value of hard work in the household as well outside the family in the 'market'. It is a protests agaisnt neo-liberal mcroeconomic policy that by design destroys the livelihood of the community in order to force women to be in the wage market; in the development language it is known as 'mainstreaming women'. With earthen 'prodeeps' in hand in hand, the protest was also directed against patriarchal economic policies. These hands will keep on glowing despite the darkness of the present era. A woman in Black is an international event organized since 1991. Speaking through silence and stillness, the Women in Black Movement against War and Violence, a worldwide movement for peace, has been brought to various countries of Asia such as Bangladesh, India, Nepal and Philippines. 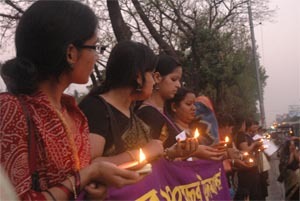 As a member of Asian Women's Human Rights Council (AWHRC) and the Secretariat of AWHRC (Bangladesh) Narigrantha Prabartana organized a Women in Black in 2003 in front of Parliament building protesting against Trafficking in Women. 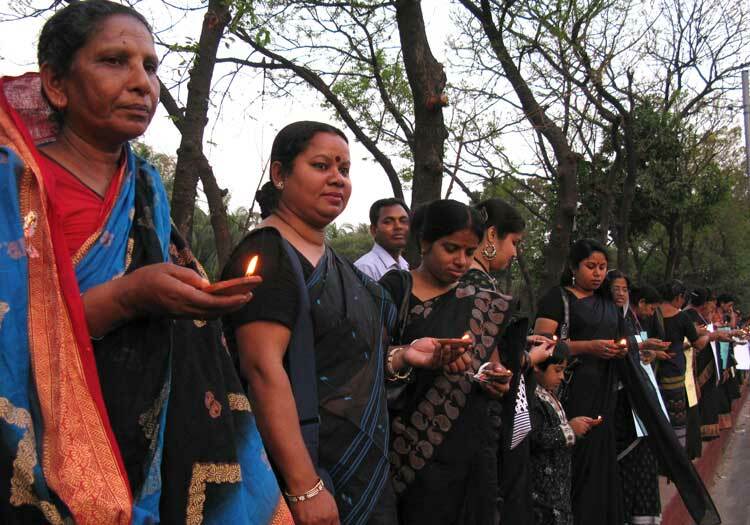 The Narigrantha Prabartana also organizes women in black on many occasions such as Bhopal day. On the Occasion of the International Women's Day, as a co-organizer, Narigrantha Prabartana along with UBINIG and Odhikar held women in black on 6th March, 2010. Women stood in front of NGP on the main road along Mirpur Road at 5 pm. The sun was still shining, although ready for setting down. In the beginning women carried the quilt of 100 years and placards with demands and statements from women. Most of the placards were against violence against women, about women's rights. But there were placards on seed preservation, no to patents, no to GMOs etc. Placards were there asking why there are locks in the gates of the garment factories. Women spoke briefly on the issues in the mike and they sang songs such as "Amra korbo Joy..... (we shall overcome). At about 5:45 pm, the quilt was folded and the kupis were lit. Now the black clothes of women and the candles in their hands became visible. As the sun started setting leading to the darkness, the candle lights blew in the hands of hundreds of women standing on the street. It may be noted that the banner of the Women in Black was in purple colour to match with the colour of the International Women's Day.